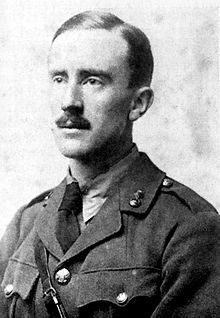 John Ronald Reuel Tolkien was born on the 3rd January, 1892 at Bloemfontein in the Orange Free State, but at the age of four he and his brother were taken back to England by their mother. After his father s death the family moved to Sarehole, on the south-eastern edge of Birmingham. Tolkien spent a happy childhood in the countryside and his sensibility to the rural landscape can clearly be seen in his writing and his pictures. The following is a personality profile of J R R Tolkien based on his work. J R R Tolkien is unconventional and shrewd. He is laid-back, he appreciates a relaxed pace in life. He is intermittent as well: he has a hard time sticking with difficult tasks for a long period of time. But, J R R Tolkien is also empathetic: he feels what others feel and is compassionate towards them. He is also relatively unconcerned with tradition: he cares more about making his own path than following what others have done. Considers independence to guide a large part of what he does: he likes to set his own goals to decide how to best achieve them.